Birds come and go this time of year. Some fly for long distances to find shelter in a warmer climate. 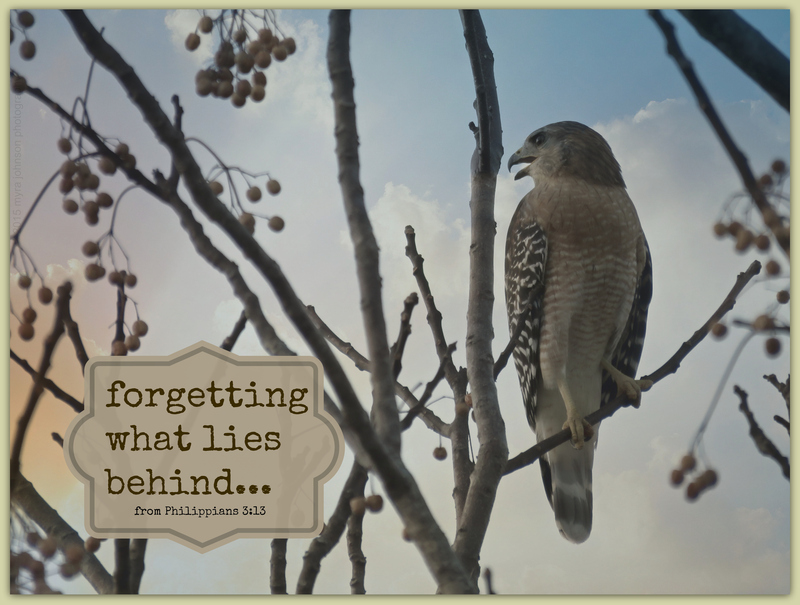 In a way that I could never fully understand, I believe God tells the birds when and where to travel. I call it God’s direction. When the birds set out on their journey, surely they must have a confidence in what they will eventually find. A faith, if you will, on the part of the bird, to trust in that which it cannot yet see. God has told us of what is in store for those who love Jesus. We have an assurance that comes from Him about our future. We have confidence in what we hope for. Today, notice any birds that might be around you as you travel to work or look out your window. They listen for God’s direction. Who was that person I used to be? Because today I am free! Who are those that are lonely? Who are those that are afflicted? Who are those that could tell them? It seems that I have been noticing birds a lot lately. This afternoon, my husband was watering a section of our yard that had very little grass. Having recently planted grass seed in that area, he wanted to make sure it had enough irrigation to grow. I watched a mocking bird fly up into a tree just past the water that was shooting up in streams from the hose on the ground. As he sat there looking at the water, I was able to get a few photos of him. As believers of Jesus, rivers of living water flow from us. Other people are watching us. At work they see us, talk to us, notice how we respond to everyday situations. At school, at the store, at a ballgame, in church, on a train, in a grocery store line. Our families watch us at home–at the dinner table, at the family reunion, when we are tired, when we are energetic, when we are happy, when we are sad. Are they seeing the rivers of living water? Through everything that happens–as believers of Jesus, we have the opportunity to show that living water is flowing from our lives. The Eastern Bluebird stood on the apex of my neighbor’s roof. Sometimes we have to get to the very top of our circumstances–above them all–and look at things from an eternal perspective. We have to be on guard, for temptations and difficulties surround us. No matter what, we know we can stand firm in our faith. Because He is and we are not, we can be courageous. Our strength comes from Him. Make music to praise the LORD, you faithful people who belong to Him. Remember His holiness by giving thanks. I saw him among the branches of the tree in my front yard. The sun wasn’t far from setting and the blue jay was perched high. Wanting just to be quiet and calm while enjoying a few moments outside, I listened to the various birds sing and tweet as they prepared for nighttime to fall. When the birds sing, they make music. They are able to do so because God gives them that ability. With each chirp and call, they testify to the greatness of their Creator. I want to praise God with my voice and with instruments as I make music, giving thanks. That is possible because He gave me a voice and the ability to play instruments. Thank You, God, for all that You have done for me. All praise belongs to You. We may feel lonely in our lives, but we truly are never alone. God is with us, always. When I arrived at work, the tree by the parking lot was filled with birds. I could hear them speaking with their chirping and tweeting. As I watched, some flew away and others came to rest on the branches of the tree. I am sitting now in the hospital room of a family member. God knows every bird in the tree I was looking at. He knows me and every member of my family, too. “ ‘When people fall down, do they not get up? The bird was perched on top of the feeder, looking down as I photographed him. I wonder what birds think about the feeders that people put out for them. Do they understand that an actual person somehow gets all that seed and is placing it out where they can have it? Do they wonder with amazement how an entire container of just seed happens to be near them? Or do they just accept that it is simply there and never ponder how or why? God provides for the birds by natural means and also by enabling humans to gather seed and generously present it in various types of feeders. God provides for the birds. We are worth much more than they are. God will provide for us, too, in whatever way we need. And when He does, do we understand and acknowledge that it is God who is providing for us? Looking out across the water to a small island, I could see something in the wildflowers growing there. An Anhinga bird was behind them. Looking at my photograph later, it almost looks as if he is hiding. He does blend in with a certain amount of camouflage, yet upon closer inspection, he’s hard to miss. I’ll never know if he was truly intending to hide that afternoon, but I can certainly identify with him if he was. At times in my life–even as a child–I wanted to just hide away and be alone, in what I felt was a safe place. There are many reasons, however, to hide. We may hide from people and flee from circumstances, but we cannot hide from God. He sees us wherever we are, in whatever condition we are in. Our emotions may urge us to hide, yet His great love beckons us back into the open–in the light of His comfort and forgiveness. As I was looking down past the shallow waterfall, I noticed a duck playing in the water. There were other ducks nearby, enjoying the refreshing flow on a very hot day. God made the ducks to be water birds. Although they couldn’t tell me, I think these beautiful creatures were delighting in the rushing bubbles as the water made it’s way down to the lake. I think God made us to take delight in Him. If we seek Him and draw closer to Him, the desires of our hearts will be given to us as our desires become focused on Him. Oh, for wings like a dove, to fly away and rest! I would fly to the far-off deserts and stay there. I would flee to some refuge from all this storm. He protects us from the storm of sin. He gives us new life and a new beginning. I watched as the juvenile heron walked on the edge of the water. He was so small—at least when compared to what he would someday be. You see, he’s not just any heron. He’s a Great Blue Heron. There will come a day when he will be large and graceful with flowing feathers off the top of his head. That day has not come yet, but God has made it so that it will. We have an internal map made by God, as well. We are babies and children for a few short years, then we become adults. When we are “born again” as a new Christian, we begin a growth process, also. When we accept Jesus as our Savior, we are “new” Christians. We are young in our faith, but we are on a pathway of change as we learn to trust God more and more. It is okay to be new. We will be different one day. God has made it so that we will. A week or two ago, I was doing a photo session for a family of four in a nearby park. The park borders a large lake and there are always a lot of birds near the water. As I was photographing the family out in the open grass, a duck came walking up to us. Since ducks are normally shy creatures that keep their distance, this was quite a delightful surprise. He was probably hoping we had something to feed him. He was going to make the first step in being friendly. For whatever reason, he marched right up and melted our hearts. I started taking photographs of the children with their new duck friend. Why, if a duck wanted to be nice to us, we were going to be nice to him! In the verse above, Jesus tells us to do to others what we wish they would do to us. What would happen if we showed interest in people the way we wished they would be interested in our well being? What if we would just take the first step and walk up to someone we do not know at work or church with a sincere smile and a cordial word? Would their heart be open to friendship because of that first step on our part? If a duck could be friendly to people he didn’t know, couldn’t I? Now may the Lord of peace Himself give you His peace at all times and in every situation. The Lord be with you all. What can we do when bad news arrives? Last week, we found out that the young son of someone we know has leukemia. About the same time, some new friends of ours had a baby very prematurely and the baby died. What could be said at times like these? I am not a doctor, so I would not have been able to advise either couple on medical issues, even though I really do care. Nor am I able to heal a broken heart, even though I hope for that healing. Jesus is the Lord of peace, however, and He can carry any of us through any and every situation—even illness and death. I just know that He knows all things and He is able to do all things. Even when it seems impossible, He can comfort and heal. The LORD can give you new strength. A new vision for the future…. 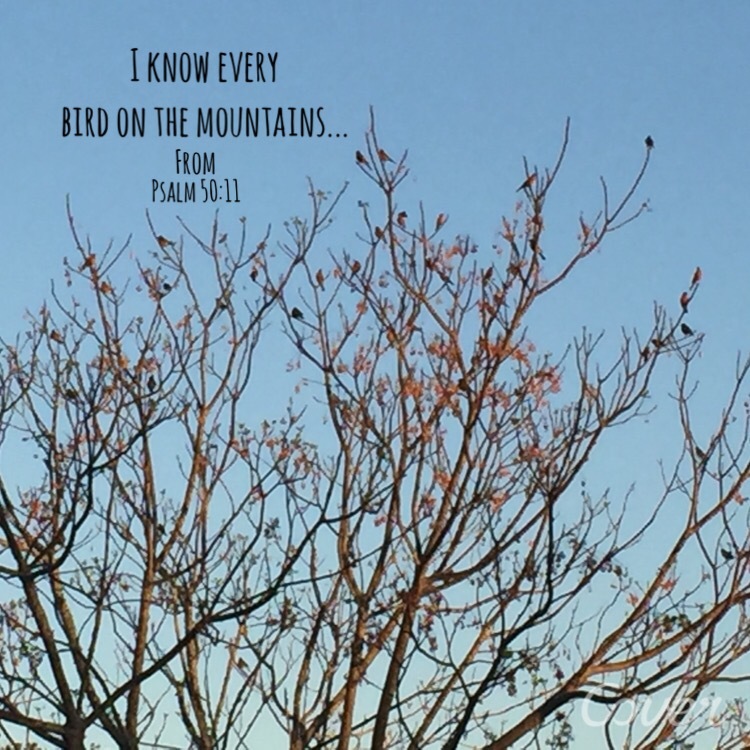 Birds sing to the Lord. When lions roar, they are singing, too. As the dolphin jumps for a moment from the water with elegance and grace, it is “singing” to the Lord. The golden butterfly sings as it flutters from bloom to bloom. All the creatures of the earth sing to the Lord, their Maker. I could hear the screech of the hawk as I was about to get into my car. Flying toward the tall tree, it came to rest in the branches that were already thinning as colder weather approached. Changing my schedule for a few moments, I took the opportunity to photograph the stately bird. In one of the photos, his body was facing forward in the direction he was headed when I first saw him. His head, however, was turned around—looking back from where he had flown from. As believers in Jesus, we must look ahead at our new life in Him. We can forget the old way of life that we had, with no need to look back. We must keep looking forward. We must trust in Him.